By now everyone must realize that they key to success is having a website for your business. Once you have a website for your tattoo salon you will be able to showcase your most important information to your audience and gain their trust. They will need to see your portfolio, prices, testimonials, book appointments, or send inquiries. All these features are necessary and these top 10 tattoo salon WordPress themes have them. Apart from coming with handy features and tools like the one mentioned above, all these professional tattoo salon WordPress themes also have gorgeous, creative, modern designs. Moreover, they are intuitive and user friendly without being too simple. Quality matters especially for websites even if you have to pay a bit more to get it. I forgot to mention that every single one of these tattoo salon WordPress themes are still developed, enhanced, and entirely supported both through premium customer support and extensive documentations. Save time and choose one from here. 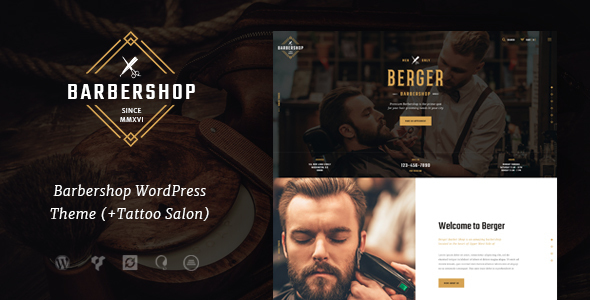 Berger is a very manly WordPress theme ideal for barber shops and tattoo artists. It is a perfect combination between style and professionalism. Whether you are part of a tattoo shop or a tattoo artist on its own, this theme is a great choice for you. It gets the job done by having features such as several page layouts, beautiful hover effects, interactive slider, stunning navigation, powerful framework and theme panel, custom widgets, and shortcodes. All these options are topped off with a fully responsive design. Salon is one of the most powerful and cool tattoo salon WordPress themes on this list. It was launched a couple of years ago and it is still one of the most popular ones. Salon is constantly updated and maintained by the team of developers behind it and it has a sophisticated and chic design perfect for an artist. It comes with full screen navigation, online store, Visual Composer, booking plugin, lifetime updates, complete documentation, and events calendar. With all these options, it will be beyond easy for future clients to get in touch with you and book an appointment. You have to check Salon out and see what more it brings to the table. Another impressive addition on our top 10 tattoo salon WordPress themes. Trueman is a true creative and professional theme when it comes to this niche. It will suit any area from barber shops to hair and tattoo salons. Trueman intends to bring the best out of your business and comes packed with features like mobile optimization, user-friendly sliders, stunning effects, homepage layouts, and great support for beginners and advanced users. Purchase this theme and get going! 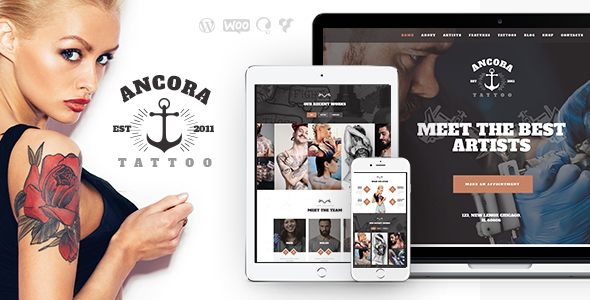 Ancora is a clean, easy to use, adaptable, artistic, and strong tattoo salon WordPress theme. Its dazzling and dark design could not be more ideal for a tattoo parlor. Ancora has a bunch of impressive features and tools among which are layout features, main menu slider, featured slider, Visual Composer, interactive search, Google fonts, and custom shortcodes. With Ancora, your audience’s experience will be an unforgettable one and paired with your own creativity success is certain. Build your website today with Ancora! Are you looking for a great theme? 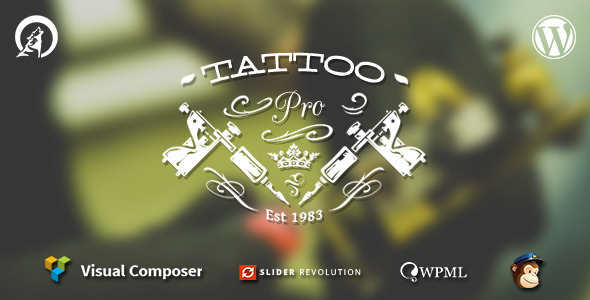 Tattoo Pro might just be the best one on our tattoo salon WordPress themes. It is beautifully designed with a simple and responsive layout that will fit any business. With Tattoo Pro you can choose your layout and color scheme, create responsive galleries and sliders, build unique pages with Visual Composer, add a video background, and use custom widgets. Along with the theme you also get MailChimp integration and Slider Revolution. 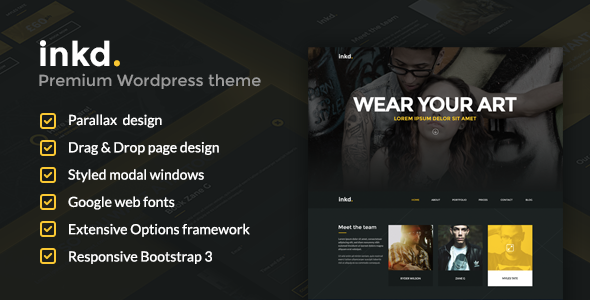 This theme is a great fit for ink professionals all around the world. 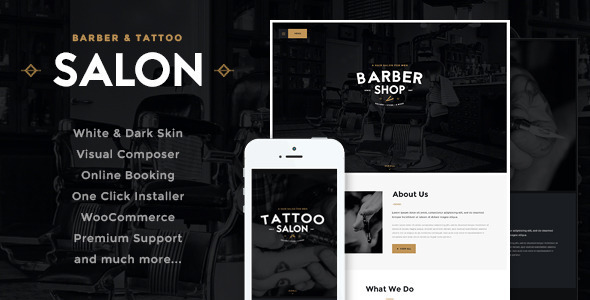 Barber is a stunning, responsive, premium tattoo salon WordPress theme that is known for its gorgeous design and useful functionality. If you are looking to solidify your online presence this is the perfect theme for you. It includes more than 10 pre-made demos, appointment form, portfolio, RTL support, social media buttons, and an intuitive admin panel. Furthermore, Barber is readily responsive and SEO optimized, not to mention that is comes with an extensive documentation. Try Barber today! 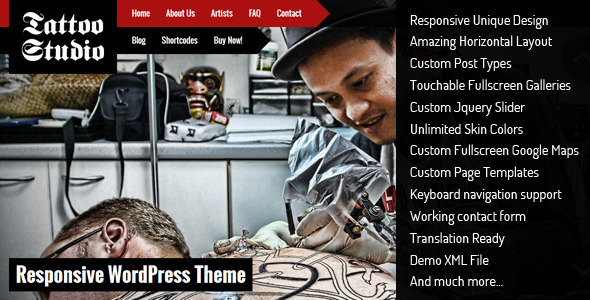 Taking up the seventh place in our tattoo salon WordPress themes list is Tattoo Studio. Every inch of this amazing theme was built and crafted to perfection and for the sole purpose of aiding tattoo parlors and artists. With Tattoo Studio you can use unlimited skin colors, uniquely designed page templates, custom posts, Google maps, and so much more. You can easily showcase your work and designs with this theme as well as supplement information to your audience. Check Tattoo Studio out! A professional and modern website can attract a larger audience. For this reason alone you should take into consideration Ink Tattoo Studio. By using this theme you will maximize your website’s look and it will be a pleasure for your users to navigate. 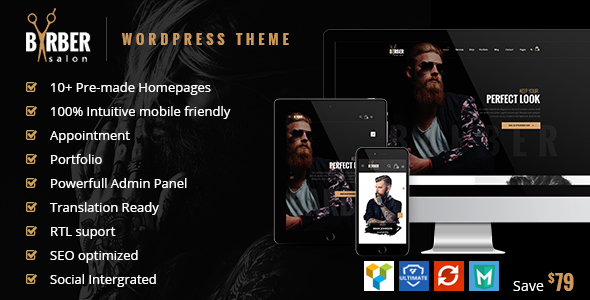 Ink Tattoo Studio features options like 6 color schemes, blog template, widget ready, parallax effects, galleries, full documentation, responsive slider, child theme, and translation support. You have nothing left to worry about – this theme has it all! Inkd is one of those tattoo salon WordPress themes that come with a ton of useful features ideal for any type of tattoo related websites. It has a modern design and it highly intuitive as the developers of this theme are experienced and professional. This theme will make the user experience greater slowly paving your way to success. The best features of this theme are the drag and drop page builder, parallax design, CSS3 animations, booking form, Google maps, and more. Give this one a try. 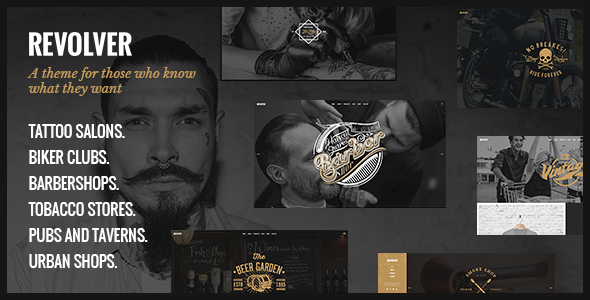 We are ending our list for the best tattoo salon WordPress themes with a stunning, cool, and manly theme suitable for tobacco stores, motorcycle sellers, barber shops, and tattoo salons. Revolver features 6 pre-designed homepage templates that are fully customizable through the admin panel. No matter the business you own, you cannot forget about mobile devices and Revolver is completely adaptable to all screen resolutions. Furthermore, it is compatible with WooCommerce, pixel perfect, retina ready, and quick to set up. Save your valuable time and money by selecting one of these incredibly powerful tattoo salon WordPress themes. Each one will meet and surpass your expectations for premium themes. 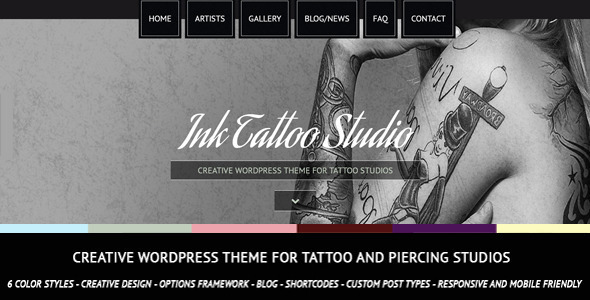 Have you heard of a great tattoo salon WordPress theme that deserves a spot on our list? Let us know!